US #2186 from the Great Americans Series. Click image to order. 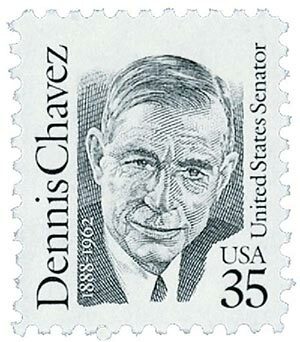 The first American-born Hispanic senator, Dionisio “Dennis” Chávez was born on April 8, 1888, in Los Chaves, New Mexico. Chávez’s family had lived in Los Chaves for generations. In fact, he always prided himself in saying he was “American before Plymouth Rock,” because he had ancestors that lived in the New World on a Spanish land grant in the 17th century. In 1895, Chávez’s father moved the family to Albuquerque for railroad work. Chávez attended school there until the 7th grade when he needed to take a job to help out the family. His first job was driving a grocery wagon at the age of 13. However, Chávez continued to learn by spending his evenings at the Albuquerque Public Library studying engineering as well as American history and politics. Chávez was eventually fired from his job at the grocery store for refusing to deliver groceries to strike breakers. Item #M91-14 – 1991 Chávez First Day Maximum Card. Click image to order. Meanwhile, Chávez used his new knowledge of engineering to get a job as a surveyor and eventually assistant to the Albuquerque city engineer. Chávez’s work earned him the attention of Senator Andrieus A. Jones, who hired him as a Spanish interpreter in 1916. After Jones won the election, Chávez moved to Washington, D.C. to work on his staff. Jones then encouraged Chávez to attend Georgetown University Law School. 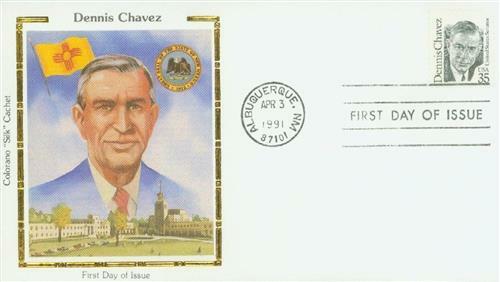 US #2186 FDC – Chávez Silk Cachet First Day Cover. Click image to order. 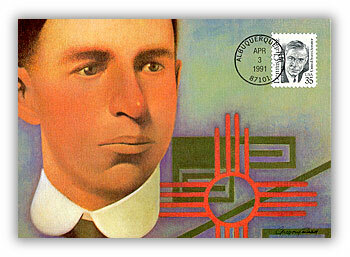 After graduating in 1920, Chávez moved back to Albuquerque where he opened a law practice and joined local politics. Two years later, he was elected to the state House of Representatives, where he supported legislation offering free text books to school children. In 1930, he was elected to the US House of Representatives. In that role, he supported the Elephant Butte Dam and Carlsbad Irrigation Projects, as well as compensation to New Mexico Pueblo Indians. 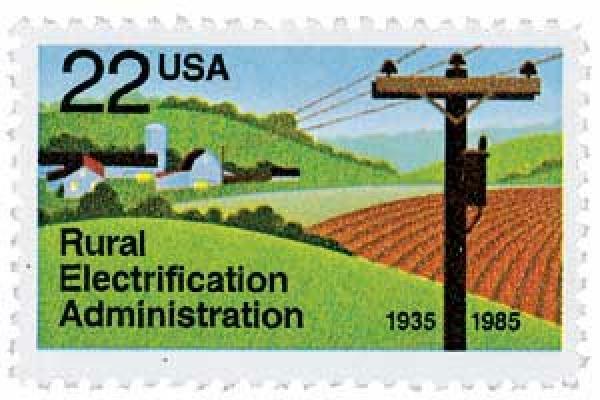 US #2144 was issued for the 50th anniversary of the Rural Electrification Administration. Click image to order. Chávez joined the Senate in 1935 to fill a vacancy and then easily won election to that office the next year. For the next 27 years, Chávez used his position to promote the development of resources in the West, including water and soil conservation programs, federal crop insurance, and rural electrification. He also introduced several bills aimed at protecting Native American lands and rights. 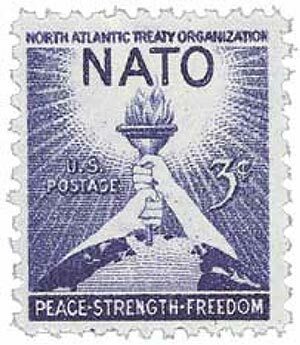 US #1008 features imagery symbolizing peace and strength. Click image to order. On the national stage, Chávez supported America’s involvement in NATO (North Atlantic Treaty Organization), helped create America’s Good Neighbor Policy with Latin America, and helped develop the Pan American highway. Chávez also co-sponsored the Fair Employment Practices Commission Bill, which would prohibit discrimination in employment. However, these rights wouldn’t be won until the 1964 Civil Rights Bill that was passed two years after his death. Chávez died on November 18, 1962, in Washington, D.C. President Lyndon B. Johnson delivered his eulogy, stating that, “Chávez was a man who recognized that there must be champions for the least among us.” In 1966, a statue of Chávez was added to the Capitol building’s Statuary Hall, the only such statue there to honor a New Mexican. 4 Responses to "This Day in History… April 8, 1888"
Last paragraph it should be Vice President Johnson not President in 1962. Last paragraph it should have Vice President Lyndon B Johnson not President in 1962. Thanks Mystic. A history lesson of how a young man sacrificed for his family at a young age and later in life when he was elected to serve his home state had a great moral compass that guided him. Why only one statue for a New Mexican in Statuary Hall? I thought every state had two statues.